Vancouver, BC - Skyharbour Resources Ltd. (TSX-V: SYH) (OTC Grey: SYHBF) (“Skyharbour”) is pleased to announce the Western Athabasca Syndicate has received drill permits for its flagship Preston Lake Uranium Property (the “Property”). The diamond drill program is slated to commence in the second week of March and will test several highly prospective targets identified by the extensive 2013-2014 fieldwork. 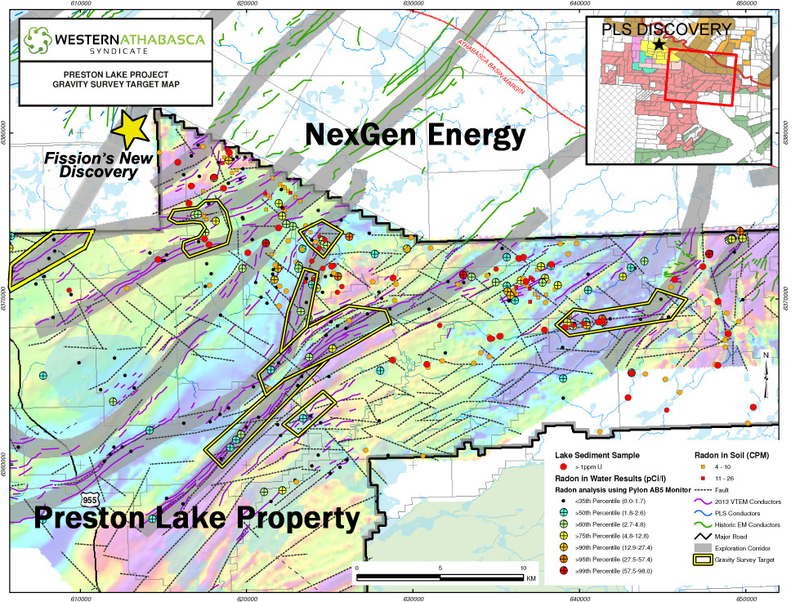 The 246,643 hectare Preston Lake Property is the largest land package proximal to Fission Uranium Corp.’s Patterson Lake South (“PLS”) high-grade uranium discovery, as well as the recent discovery (“Arrow Prospect”) made by NexGen Energy (TSX-V: NXE) on the Rook 1 Project (see NexGen’s news release dated Feb. 19th, 2014). The Syndicate holds title to an extensive and geologically prospective property package in the southwest Athabasca Basin region including properties strategically located in all directions around the PLS and NexGen discoveries. Skyharbour and its Syndicate partners are currently carrying out a ground EM survey to further refine conductor trends and drill pad locations. Additional details of the upcoming drill program will be provided when drill hole locations are finalized. To date, the 2013-2014 exploration expenditures on the Property total approximately $2.1 million and have delineated numerous geological, geophysical and geochemical targets associated with eight prospective exploration corridors. The Syndicate continues to employ a systematic, proven exploration methodology that has led to numerous uranium discoveries in the region and throughout the Athabasca Basin. This has been very effective in identifying numerous high-quality targets at Preston with similar geological features and exploratory indicators as those at the nearby PLS and NexGen discoveries, as well as other deposits in the Athabasca Basin. The Western Athabasca Syndicate has a booth at the upcoming PDAC Conference in Toronto from March 2 �" 5. The booth number is #2740 and all four companies comprising the Syndicate will be present. Skyharbour will also be present at its own booth #2725. We invite you to stop by to meet management and get a full update on the progress being made by the Syndicate on its projects in the Patterson Lake region of the Athabasca Basin. 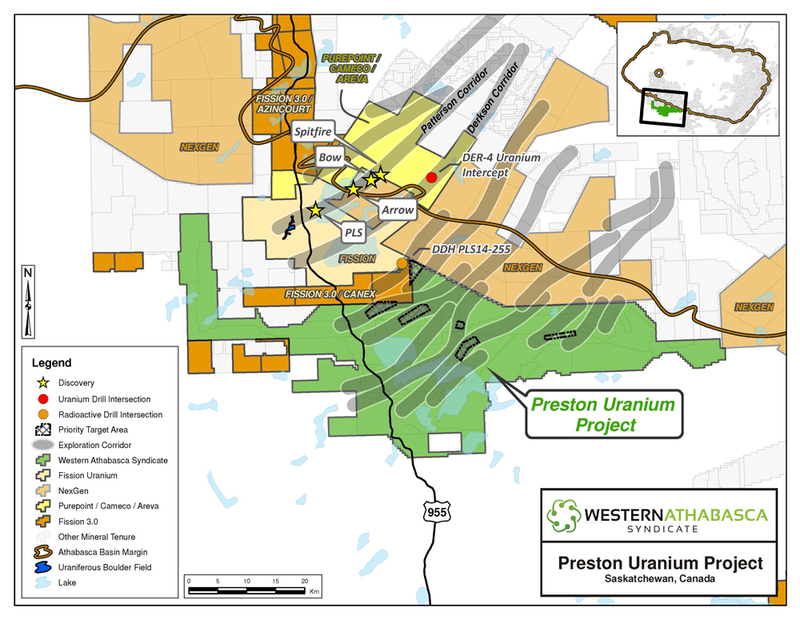 The Western Athabasca Syndicate is a strategic partnership formed between Skyharbour, Athabasca Nuclear, Lucky Strike, and Noka to explore and develop a 287,130 hectare suite of uranium properties that is the largest land position along the highly prospective margin of the Western Athabasca Basin controlled by a single group. Under the terms of the agreement, each of the four companies has an option to earn 25% of the five uranium properties comprising the Western Athabasca Syndicate Partnership by making a series of cash payments, share payments, and incurring their pro-rata amount of the total $6,000,000 in exploration expenditures over the two-year earn-in term of the agreement. The properties were acquired for their proximity to the PLS discovery and interpreted favourable geology for the occurrence of PLS style uranium mineralization. The bulk of the Syndicate land package is bisected by all-weather Highway 955 which runs north through the PLS discovery on to the former Cluff Lake uranium mine.